Congratulions on designing a beautiful kit for Hero Arts. Can't wait to get this awesome kit and your coloring book. Thanks so much for partnering up with Hero Arts, a great company!! The kit is amazing, I love everything in it! You designed a great kit. This kit is awesome! Love it! This is a beautiful kit, with lots of variety and fun things to create. Lovely designs and the kit is just icing on the cake. Congrats on your fabulous kit!! Thank you so much for sharing your gift of drawing and coloring with Copics to those of us who are creatively challenged! Thank you for sharing these beautiful floral images with us. Your talent is amazing. A beautifully designed kit! HOpe there are still some available after the 13th! No $$$ until then! Would that I could draw and color like you! Certainly a great kit! This is such a great kit!! I love all the beautiful Spring images. Looks like they will be lots of fun to color! Fabulous kit! Love your samples. Looking forward to getting my kit and your autographed book which I just ordered. You are very talented. Looks like an awesome kit and beautifully colored images. Eager to hop! What stunning flowers!! I LOVE the samples!! Congrats on collaborating with Hero Arts creating this beautiful kit!! What a gorgeous kit! Can't wait to see what's next on the hop! Eek! Squeal! I got mine ordered and am doing a happy dance. SO excited by having something designed by you. You are amazing. Beautiful kit! I love flowers. Great kit can't wait to color the flowers. Truly beautiful kit with all the floral images! Stunning kit, love all the images!!! I am loving the looks of this kit. You did a fab job, congrats! Just what I needed as a new copic colorer. Thank you for working with Hero Arts!!!! I didn't realize when I ordered my kit there were add-ons. I had to go back and order again because I couldn't miss out on these great products, especially the book. Thanks for taking the time to sign them and thanks for sharing your talent! Love your illustrations. And really wish I could color like you do! Wonderful kit and beautiful flower designs. It's great that the price point is also good. Looking forward to playing. Pretty flowers, great job. Thank you for allowing me to add a little more color into my world. I love that little snail. It is just the cutest. Reminds me of my middle son. He used to make snails out of playdoo and tell me they were running. You've designed an awesome kit! Love the flowers and coloring pages! These are gorgeous! Great for spring and mothers day cards! Love, Love everything about this kit. I have loved coloring since a child. Your designs are awesome. What fun to color and send these cards to love one. What a great kit did you designed, love it! So colorful it makes me happy. What a very beautiful kit and your cards are absolutely lovely!!! Amazing Idea, using colouring cards. This is a great kit and how generous of you to autograph all those books! Best of luck with the kit and book, I know I want them both!! This is a great kit. Thanks for putting it together. Looks like a stunning kit to work with. LOVE your gorgeous coloring techniques! Very pretty cards! Wonderful, you are an amazing artist and Hero Arts should be very happy to have you create this kit for them. You are so talented - thanks for sharing your creativity! You are so creative thank you for sharing that with us. Your kit looks so incredible can't wait to get it. Beautiful kit. So many possible cards. You are very talented. This is on my list to get when my funds become available. Beautiful kit i don't usually buy kits because there are only some parts i like but this one is spot on. 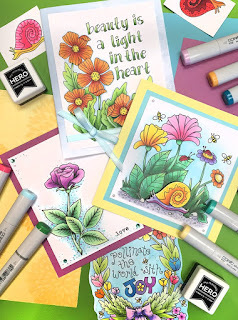 Great cards..so much fun to color! How wonderful! Love your images, especially the rose in your flowers set! Love all of the beautiful elements. What a great kit! I've started colouring pretty well every day with Copics, coloured pencils or water colours. It's so relaxing. Your kit is just the ticket! Love the kit and all of the Springy cards. I'm really enjoying the adult coloring resources available these days. Love this new kit and it looks like a lot of fun to color. What a wonderful kit--love it! This is such a beautiful kit...perfect for spring! Congratulations on this wonderful partnership resulting in this month's gorgeous Hero Arts Kit! Your illustrations are gorgeous! I love all the beautiful flowers. Makes me wish that Spring would hurry up and get here! Putting this together must have been a blast! Love your drawings and coloring! Thanks for sharing your artistic talent in this kit! Wow I can't wait for my kit to arrive! This is a beautiful kit. Thanks for sharing. It's a beautiful kit, congrats! You are def a copic Queen, that's for sure. The flowers remind me of my mothers garden, so pretty. Thanks for all your tips, I need all the help I can get, lol. I think this kit looks just perfect for my newly invested copic markers, I received those as Christmas present this past Christmas and so in love with them! You designed a wonderful kit! I will definitely enjoy coloring and creating with my kit. I lov flower stamps. This is great! Beautiful kit! So many possibilities! I have been impressed by so many beautiful things designed, it really is a huge garden to explore. God wants you to acquire any of these products. I love all of the beautiful cards you made with this kit! Thanks for sharing. This is really a fun kit. I can't wait to get your book. I need the help, my coloring skills are not so hot. This kit is stunning! I love that you have a book about coloring flowers with Copics! Thanks for collaborating with Hero Arts! Really beautiful kit. Looks so fun to try out with great examples and ideas from the book! I love your drawing talents. The coloring cards make beautiful card fronts. I would love to win this prize. Thanks for making the kit so special. I'm so intrigued with your drawings and use of copics . I love the dimension , depth you are able to create to make something look so "real".